240 Seiten, Softcover, Format DIN-A5, This Book is in English. 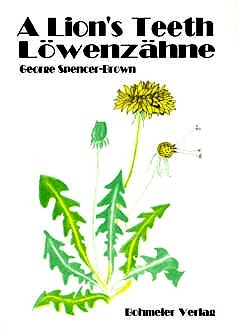 Second printing (2010) with additions and revisions. 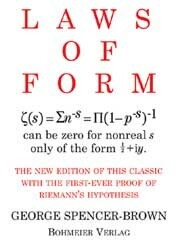 Laws of Form by G Spencer-Brown 5th English edition: At last this all-time classic has been reset, allowing more detailed explanations and fresh insight. There are seven appendices, doubling the size of the original book. Most exiting of all is the first ever proof of the famous Riemann hypothesis. To have, in print, under your hands and before your own eyes, what defied the best minds for a century and a half, is an experience not to be denied. As is now well known, Laws of Form took ten years from its inception to its publication, four years to write it and six years of political intrigue to get it published. Typically of all unheralded best sellers from relatively obscure authors, it was turned down by six publishers, including Mark Longman who published my earlier work on probability. Even Sir Stanley Unwin refused to publish it until his best author, Bertrand Russell, told him he must. ‘To endorse what he said about the book when he first read it in typescript,’ I told her. The next few years were spent in vigorous arm-twisting and incessant blackmail from us both. One of her threats was to invite me to Plas Penrhyn as her guest while Bertie and Edith were away in London. 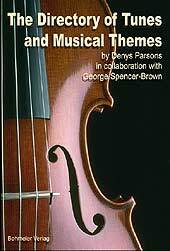 This sent Bertie into a paroxysm of terror of what the neighbours might think. He also had an irrational fear of spoiling his reputation as a mathematician, which was not good anyway, by recommending a book that had not yet been tried by the critics. He seemed totally unaware that any book he recommended, however ridiculous, would have no effect whatever on this. When we finally got him cornered, in my next visit to Plas Penrhyn, he carefully avoided mentioning the subject during the whole of my stay, and I considered it too dangerous to mention it myself. The next morning I was due to depart while Bertie and Edith were still in bed, and I thought I had failed miserably. But no! I missed my train because they had not ordered me a taxi to the station, which was their way of telling me that my visit was to be prolonged by another day. ‘To endorse what you said about the book three years ago,’ I told him. ‘You must remind me what it was,’ he said. I produced a verbatim report of his remarks, neatly typed out, and thrust it in his face. I told him that that would be very nice, but that this was all I needed just now. He contemplated the page of typescript for a moment, and then a wicked gleam lit up his face, and he rubbed his hands. ‘Supposing I don’t?’ he grinned. There is no stronger mathematical law than the law of complementarity. A thing is defined by its complement, i.e. by what it is not. And its complement is defined by its uncomplement, i.e. by the thing itself, but this time thought of differently, as having got outside of itself to view itself as an object, i.e. ‘objectively’, and then gone back into itself to see itself as the subject of its object, i.e. ‘subjectively’ again. Thus we are what we see, although what we see looks like (and is) what we are not. This incessant crossing of the thing boundary, to look at it from one side and then the other, is called scrutiny, which as a small child was I told is not polite, because by scrutinizing a person or thing we shall notice uncomplimentary (same sound, different word) qualities of the person or thing that it is rude to mention or think about. At the age of three I discovered that most people, from what they told me, could stop themselves from thinking these rude thoughts, which is I suspect why ordinary people do not usually do mathematics, where you have to repeatedly cross and recross the thing boundary. In fact Laws of Form is the book I wrote simply about doing just this and nothing else. When the book finally came out, in 1969 April 17, its effect was sensational. The Whole Earth Catalog ordered 500 copies, which was half the edition, and other big dealers followed suit. The first printing was sold out before it reached the shops, and the publisher had to order a hurried reprint to meet the demand. Nobody had seen anything like it. Here was an upstart author explaining the mysteries of mathematics that the so-called greats of the science in the last 8000 years (at least) had never noticed, and in language that a child of six could follow. Having achieved my life’s ambition of composing and publishing a nearly perfect work of literature by the age of 46, I was suddenly confronted by the problem of what to do with the rest of my life. I knew, and so did everybody else, that I could never top this achievement, so with what significant purpose could I carry on? One thing I could and did do was learn some mathematics. One of many reasons why the book is so famous is because I did not know any math, apart from school stuff, when I began to write it. I had to teach myself, and with me, my readers, as I went along. In ten years I had learned enough to become a full professor in the University of Maryland, although I still thought I knew very little. Math is almost impossible to master without personal tuition, and I was lucky to strike up friendships with D H Lehmer and J C P Miller, both, as it happened, experts on Riemann’s hypothesis, in which I had no interest whatever, nor in analytic number theory in general. It was only on being told by my former student James Flagg, who is the best-informed scholar of mathematics in the world, that I had in effect proved Riemann’s hypothesis in Appendix 7, and again in Appendix 8, that persuaded me to think I had better learn something about it. I am an intensely competitive person, which comes from being repeatedly told by my mother that I would never be any good. This forced me to spend my whole life attempting to prove her wrong. The tragedy of it is that however brilliantly I performed, it made no difference. Nothing I could do would change her mind. I beat her at chess when I was four, and all she did was refuse to play with me ever again, rather than admit that I was good. If you solve a famous unsolved problem by mistake it doesn’t count. You have to say ‘I am going to solve this problem,’ and then solve it. So I had to spend another ten years learning analytic number theory, which I hated, in order to secure and objectify what I had done, and make it presentable. March 2010: Second printing with additions and revisions. 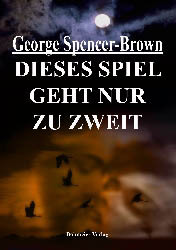 ISBN 978-3-89094-580-4, 240 Seiten, Softcover, Format DIN-A5, This Book is in English. 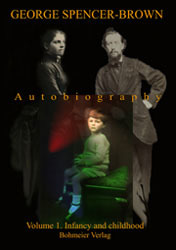 Second printing (2010) with additions and revisions.